I got tired of replacing and recharging batteries every week therefore I bought a small (7cm by 7cm) solar panel that would charge batteries and power the weather station. Before mounting it on the roof of the shelter I measured its output voltage and current. The peak current was 70mA and the voltage of 6V, that is more than enough to cover the 10mA needs of the weather circuit. 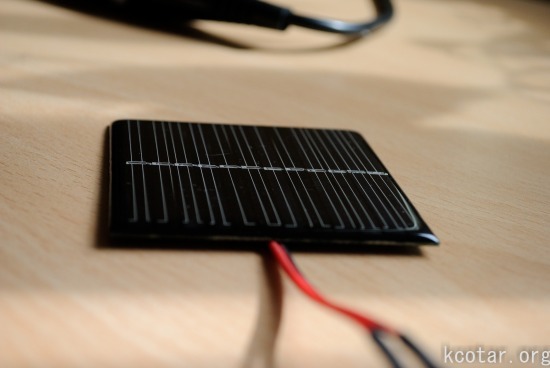 The panel is connected to the batteries using Schottky diode on the positive lead that prevents battery discharge at night. This one-way valve allows current to flow from the panel to the battery, but does not allow current to flow backwards out of the battery through the solar panel. In this design I am continuously trickle charging the battery when sunlight is present. Update: It works. So far a month on solar power.